VisitBlanes.com, Mar. 8, 2011 — The city of Blanes has approved an ambitious redevelopment project for the beachfront in the resort’s popular El Pins district. 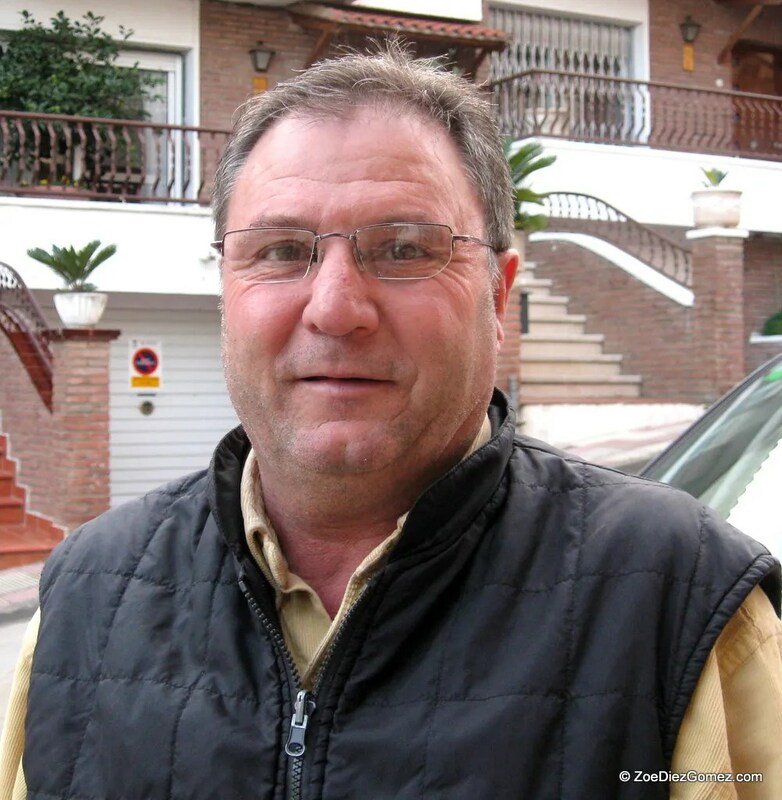 The project, which is of great importance to Blanes’ tourism industry, will cost ten to twelve million Euro. Besides giving the waterfront a new look, the upgrade is also expected to solve the recurring problems of low levels of sand — as well as other storm damage — at S’Abanell beach. Note: We leave this article here for its historical value. The plan was good, but for the time being it has fallen victim to the financial crisis. Redevelopment will take place in two phases: phase one runs from the pedestrian zone at the rocky promentory of La Palomera to Mercè Rodoreda (see map below). Phase two, which is still being negotiated, deals with the area between Mercè Rodoreda and the Tordera river. 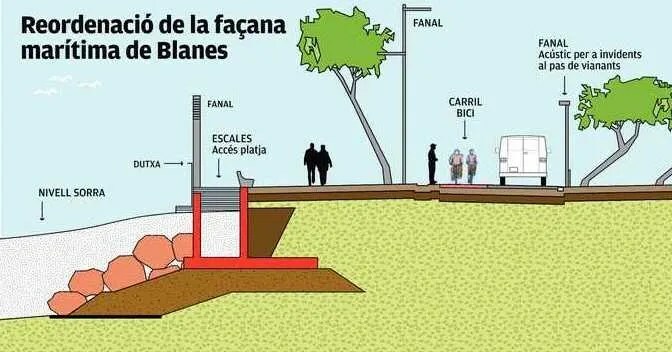 The plan — which has also been approved by Spain’s Ministry of the Environment — will be put out to bid within two or three months, Blanes Mayor Jose Trias says. However, the bidding process and execution of the project cannot start this year for lack of funds. Inititally it was expected that the work could begin as soon as this September, but the final plans were delivered to the Council after the budget deadline. Municipal authorities are confident that the project will be awarded in 2012, and that work will commence that same year. The entire venture is expected to be completed in 2015. No major construction will take place during the tourist season, so tourists will not be inconvenienced. As yet undecided are some aspects of Phase 2 of the plan, which among other things calls for the possible extension of the boulevard all the way to Malgrat. The residential neighborhood of El Pins is home to most of Blanes’ hotels and campings. An improvement project for the tourist district has long been in the planning. In March, 2009 the renovation of Passeig de Abanell was referred to as a parallel project. However, that project — which involves the renovation of Passeig de Abanell, improvements to the beach, and measures expected to help combat erosion of the beach — is now getting priority treatment. Over the past decade increasingly violent winter storms have repeatedly decimated S’Abanell beach, frequently causing much damage to the boulevard that runs along it, as well as to the buildings on the boulevard. While the sand has always been replaced well in time for the tourist season, the yearly cost associated with the recreation of the beach has become prohibitive. In 2008 tourists noticed that the sand level at S’Abanell was significantly lower than in previous years. Later that year the Costa Brava was battered by a massive storm. In what the mayor referred to as the worst storm Blanes has seen since the 1950s, the December 26 storm caused much damage to pleasure boats, fishing vessels, tourist ferries and the boulevards along Platja de Blanes and S’Abanell. At S’Abanell, two buildings on the boulevard were destroyed — the lifeguard station and a small bar, and sections of the boulevard were swept away. While the storm was uncharacteristically strong, it is believed that the low level of sand at S’Abanell contributed to the amount of damage done to the boulevard and its structures. One year later a lengthy section of the boulevard was reconstructed and reinforced with boulders. Though the repairs were of a temporary nature they have already paid off since this stretch of the boulevard has not been damaged during subsequent storms. Several unprotected sections of the boulevard did receive damage, and in some spots the boulevard’s pavement is still buckled. The waterfront to be redeveloped in Phase 1 of the project falls under the responsibility of the State of Spain. The area covered by Phase 2 is the responsibility of La Generalitat de Catalunya. The Generalidat is still negotiating some aspects of the project, which will impact the campings in that area. Both Mayor Trias and the Councillor for the Environment, Celestino Lillo, considered it important that the project would include not just the fortification and redevelopment of the boulevard, but also the traffic lanes and the pavement across the road. In Phase 1 the traffic lanes will be pushed back anywhere between 5 and 12 meters, depending on the area. In some spots, such as at Passeig de la Marina in front of the school, this will result in a loss of parking spaces. The parking spaces across the road from the school will disappear as well. This stretch of the walkway — between La Palomera and boulevard restaurant El Pins — will be moved 2 meters landinwards in order to facilitate the beach. Currently the ‘beach’ along this section of the boulevard usually consists only of huge breakwater boulders. Lilo says that when the construction is finished the Ministry of the Environment will contribute 500,0000 m³ of sand to S’Abanell beach — instead of the 100,000 m³ normally provided. At that time the beach will be anywhere from 2 to 12 meters wide. The boulevard along S’Abanell beach will be protected by a breakwater of huge boulders buried underneath the sand. Buried underneath the sand across the entire boulevard will be a 3 to 4 meters deep breakwater consisting of large boulders — a construction designed to prevent storm damage to the new boulevard. The boulevard will sport a decorative pavement and room for trees and benches. The same pavement will also be used for the pedestrian walkways across the traffic lanes. The restaurants along the boulevard will also be renovated. However, they will be reduced in size from 200 m² to 120 m². Passeig de la Marina — which runs between pla&#231ac de Catalunya and Passeig de Catalunya (at the fountain) — will remain a two-way street, but traffic along Passeig de Abanell will run South only (thus in the direction of the campings). A bike path will be created alongside the traffic lane. In addition, some side streets of Passeig de Abanell will be turned into pedestrians-only zones. Phase 2 of the project will have a big impact on four campings along the seafront: Camping Blanes, Bella Terra, Voramar and El Pinar. Camping El Pinar — at the Southernmost end, next to the Tordera river — will reportedly disappear as it is located on property that, according to the zoning plan, is part of the seafront. The other three campings will have to give up some ground, as the boulevard in that area will be pushed up to 40 meters landinwards. This is necessary because the city and the Generalitat plan to fortify the shore in this area. In addition there are plan to extend the boulevard not just to Avingude de la vila de la Madrid, but also to extend it all the way to Malgrat so that the two sea-side resorts are connected. By virtue of its relative size Camping Blanes is expected to lose the least amount; Bella Terra more, and Voramar a big chunk of ground. The camping owners are reluctant to give up space. They are negotiating with the city as well as with each other. Bella Terra reportedly has offered to buy whatever is left of Voramar in order to recoup its own loss of acreage. The plans for Phase 2 can not be finanalized until all parties come to an agreement. Incidentally, last year El Pinar and Voramar, afraid of another devastating storm, illegally built a defense wall consisting of large boulders. The city fined the campings a total of €6,000, but notes that the remaining campings will benefit from the fortification measures included in the redevelopment plan. 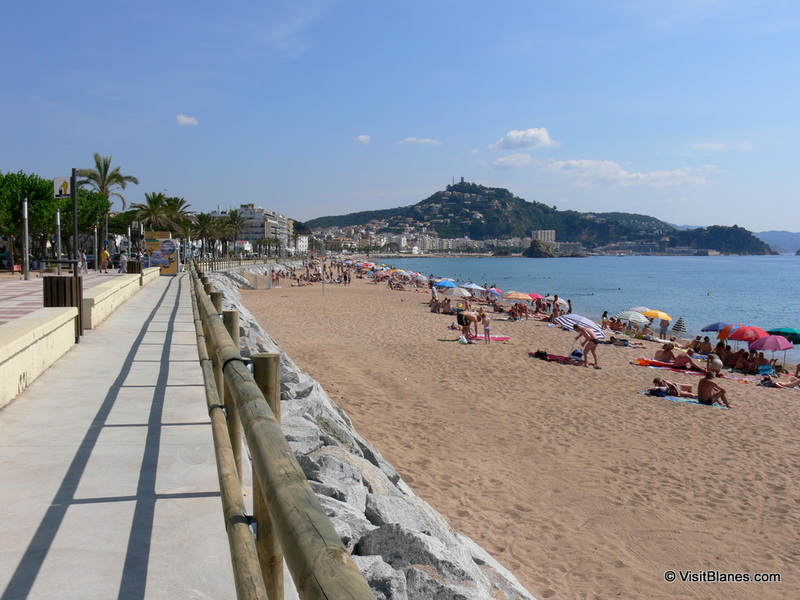 As it has done every year, the City of Blanes will make sure there is enough sand on the beaches from Club de Vela at the harbor to the Tordera River. Meanwhile work on the harbor enlargement and fortification project has steadily advanced. 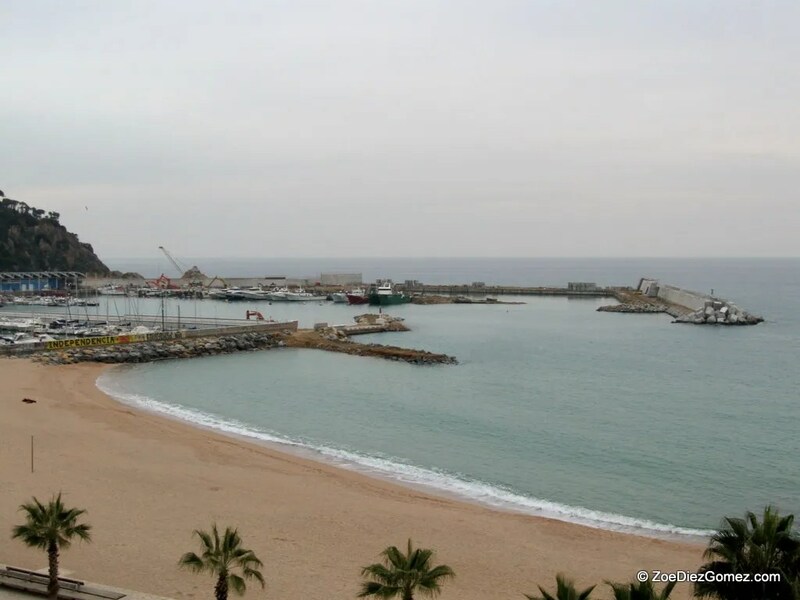 That project also includes the building of a jetty for the tour boats that ferry tourists between Blanes and other resorts along the Costa Brava coast. When the harbor project is finished the retaining wall will have been transformed into a counterpart of the popular seafront boulevard along Platja de Blanes and the yachting harbor. The city has said it will encourage tourists and locals alike to use the harbor area as an ideal place to eat, walk and recreate. The walkway atop the retaining wall will include concession stands.